To understand how magnets work within the body, it helps to understand some basic anatomy and physiology. This helps to understand exactly how magnets affect the body. Your blood is a living tissue that circulates around your whole body via a network of arteries, veins and capillaries, it carries nutrients, oxygen, hormones, antibodies, heat, electrolytes and vitamins to the body�s tissues. Blood contains red blood cells, white blood cells, platelets, plasma, electrolytes, hormones, minerals and iron. How Do Magnetic Fields Affect Blood Flow? Magnets are composed of metal alloys such as iron, nickel or cobalt. They will attract many different types of metallic particles. The blood contains iron and when therapeutic magnets are placed on the skin the magnetic field penetrates through the skin and into the surrounding tissues and blood stream. The iron in the blood is attracted to the magnetic field, this causes movement within the blood stream and the increased activity causes the blood flow to improve. The increase in blood flow is localized to the area where the magnets are placed, unless the magnets are placed directly over a major artery such as the radial artery (the wrist pulse point) or the carotid artery (the pulse point in the neck). 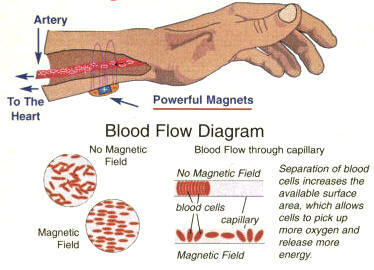 When magnets are placed over a major artery, there is a much larger perfusion of blood flow so the magnetic field is carried further around the body. When the body�s blood flow oxygen level is increased, nutrients and hormones are distributed to the organs and tissues much more effectively and quickly. Your organs have a fresh rich supply of oxygen and nutrients to nourish them. Plus the tissues also gain oxygen, healing nutrients and hormones including endorphins, which are the body�s natural pain killing hormone. If you have an injury or ailment which is supplied with regular fresh oxygen, nutrients and endorphins then your injury or ailment will heal much faster and the pain will be reduced by the body�s own pain killing hormones (endorphins). How Do Magnetic Fields Affect Cells? In a normal healthy cell, the ions are distributed around the cell with all of the positive ions on one side and the negative ions on the opposing side. The ions which live outside of the cell in the tissues will align with those inside of the cell so that opposing poles are together with the cell membrane between them (see diagram of healthy cell below). This allows fluid, oxygen and nutrients (fluid exchange) to move freely in and out of the cell, while maintaining the natural balance within the cell (homeostasis). In a diseased (injured) cell, the positive and negative ions do not stay on opposing sides of the cell. They are disrupted and scatter randomly around the cell. At the same time the ions on the outside of the cell membrane also become scattered as they try to find their opposing pole, this results in cellular imbalance. Extra fluid from the tissues outside the cell is able to penetrate the cell which in turn pushes vital nutrients, hormones and electrolytes (salts) out of the cell. The cell�s ability to function is greatly reduced and cellular degeneration begins, which if not corrected will lead to the cell dying. When a static (fixed in place) magnetic field is applied over an injured (diseased) area, the magnetism penetrates into the tissues and surrounds the damaged cell. The magnetic field that is created around the outside of the cell will pull the ions, both inside and outside, back into alignment. The result is that the ions once again return to their correct position within the cell. The extra fluid that has penetrated the cell is pushed out (via osmosis and diffusion) and returned to the surrounding tissues. The cell regains its natural healthy balance and any damage is repaired over a period of days (see diagram of a cell with a magnetic field). Inflammation is the body�s reaction to invasion by an infectious agent, antigen or even just physical, chemical or traumatic damage. The inflammatory reaction is one of the body�s oldest defense mechanisms. When damage occurs the body�s automatic defense system starts the inflammatory process within seconds. Blood flow is firstly increased at the point of injury, the blood vessels widen (vasodilate) to allow oxygen, clotting agents (platelets) and white blood cells to penetrate the damaged tissues. Over a period of hours the concentration of white blood cells increases at the injury site (white blood cells fight infection). A white blood cell engulfing bacteria, infection or disease. The presence of extra fluid, white blood cells, and increased blood flow within the tissues causes the damaged area to enlarge and swell... this is commonly known as oedema. If untreated or caused by a chronic "incurable" disease process such as arthritis, fibromyalgia, and spondylosis, inflammation can become chronic. When removal of the foreign bodies that are causing the inflammation is ineffective, damaged cells become fused together, forming gigantic cells with multiple nuclei (the brain of the cell) which in turn eventually become granuloma. How Do Magnetic Fields Influence Inflammation? When static magnets are placed over an area of inflammation, the magnetic field penetrates through the skin and deep into the tissues and blood stream. Damaged cells will react to the presence of a magnetic field by realigning their ions into the correct position. This begins the process of eliminating the excess fluid from with in the cell. Cell damage will stop and healing of the cells will begin over a period of days. Magnetic fields will also affect the white blood cells that are surrounding the injury and fighting the disease. White blood cells fight infection and disease by engulfing infectious and diseased and consuming them (phagocytosis). During this process the white blood cells release toxins into the blood stream. The body can not detoxify and excrete these toxins safely so they are stored in the tissues as small hard pockets of fluid (cellulite). When a magnetic field is present in the blood, toxins in the tissues are drawn out as the magnetized blood passes through the tissues. The toxins are then carried to the liver for detoxification and on to the kidneys for excretion. When inflammation in the body is alleviated, the damage caused by the inflammatory process begins to be repaired by a fresh and rich supply of oxygen and nutrients. Cells that have been disrupted and de-oxygenized begin to heal, and tissue regeneration starts. Excess fluid is eliminated from the body and toxins are removed. The circulatory system returns to normal and the heart does not have to work so hard to pump extra fluid around the body. Magnetic fields will stabilize all of these processes and aid the body in its recovery. 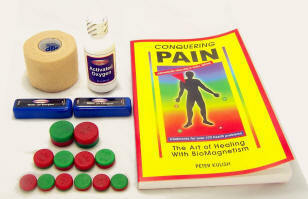 Magnets Do Not Block Pain Signals, They Treat the Cause of the Pain. Depending on the type of drug, the signal may be interrupted at the pain stimulus or at any point along the nerve pathway to the brain. Pain killers only last for a short period of time. Depending on the type of pain killer and where they interrupt the pain pathway and the strength of the drug, they can last from 4-12 hours. Magnets do not block the pain signal. They work on the cause of the pain, which is why static magnets have to be placed as close to the point of pain as possible. Trauma alone does not cause all of the pain. Pain is also caused by pressure on the nerves. This can occur with out a traumatic injury, as with long standing chronic conditions. Joint wear and tear, chronic damage from earlier injuries or chronic inflammation can cause pressure upon nerves. The pressure upon the nerves is usually caused by swelling or inflammation around the injury, this extra fluid causes the tissues to swell and thus places pressure upon the nerve endings. Compression of the nerves causes constant pain stimuli to be sent to the brain. This causes the chronic constant pain, that is often associated with long term ailments. To relieve the pressure on the compressed nerves the excess fluid in the tissues must be removed. Once the pressure has been removed the pain will subside. Magnets do reduce the inflammation in the tissues therefore they are very effective at reducing pain at the point of injury. Because the cause of the pain has been removed ( i.e. the inflammation) the pain relieving results will last for a much longer period of time than pain killers, which are just blocking the signal. Whilst the magnetic field is reducing the inflammation it is also improving blood supply to the injured area. The extra blood flow brings fresh rich oxygen, nutrients and hormones. One of these hormones is endorphin. Endorphin is known as the �happy� hormone as it is responsible for mood enhancement. The other function of endorphin is to kill pain naturally. As increased blood flow reaches the injured area the concentration of endorphins increases and pain is reduced. How Long Before Magnets Will Relieve Pain? Magnetic fields will influence individual areas of the body in different ways. For example a swollen knee joint may respond very quickly to the presence of a magnetic field, with symptoms being alleviated with in just a few days. How ever the same person may treat another area of the body without the same quick response. The length of time that magnets will take to resolve the symptoms of an injury is entirely dependent on the severity of the ailment, the amount of inflammation surrounding the injured area, the cause of the ailment, and the type of magnets used. Long standing chronic conditions, with large amounts of inflammation and cell damage will take longer to treat than a recent acute injury. The process is similar when looking at different peoples reactions to magnets. Each individual will react to magnets in a slightly different way. Some people react very quickly to magnetic fields and others will take a longer period of time. An individual's medical history and symptoms must be taken into consideration when estimating how long magnets will take to work for a particular ailment. As a general rule of thumb, you should not expect to gain exactly the same results as another other person that has used magnets. Just because one person experiences pain relief within 2 days it does not mean that you will garner the same results. Many people are only too pleased to talk about their own experiences with magnetic therapy and while it is always great to hear an individual�s personal success with magnet therapy, it is sometimes hard not to expect to receive the same level of response for you. Results can take any where from 2 days � 6 weeks depending on the condition and the severity of the injury. Magnetic water remains a little known treatment in the field of magnetic therapy plus there is always much speculation as to the validity of magnetizing water. Despite this skepticism, magnetic water remains one of magnet therapies most powerful treatments. Many scientists and doctors profess that it is impossible to magnetize water, that water quite simply can not hold a magnetic charge. Our answer to these people is... �do a little more scientific research and you will find that all water in it�s natural state (such as a spring) has a magnetic charge�. In order to fully understand how magnetized water works, it is important to know a little bit about the water that comes out of your tap. The original source of water is mountain streams, which flow into rivers and eventually out to sea. The water has had contact with both over ground and under ground during the passage to the sea. As the water passes under ground (many rivers and streams pass under ground) it comes into contact with the earth�s magnetic field, the magnetic charge is passed into the water and it becomes magnetized. Similarly, as the water flows over ground it comes into contact with magnetic rock (lodestone) and water is again magnetized. Once water is collected for consumption, it has to be treated and purified. During transportation to the treatment plant the water is carried in under ground metal pipes. The water is de-magnetized by the presence of the metallic lining of the pipes and when it is purified and comes out of the tap it is no longer magnetized. If you drink water from a spring at its source it will be magnetized. The benefits of spring water have long been recognized, how ever once the water is bottled and removed from the source it will only keep it�s magnetism for 3 days before it dissipates. It is not possible to permanently magnetize water. How Magnetic Fields Affect Water? 3. The ions in the water are affected. This has the effect of reducing free radicals contained within the water (free radicals are harmful substances found in the body). A further benefit of the alteration to the ion states of both calcium carbonate and magnesium carbonate is this: the structure of these compounds (which are the cause of the scale build up in water pipes, kettles, taps, etc) changes, resulting in a much decreased build up of scale due to the looser nature of the ions. This decrease in scale build up has resulted in extensive use of magnetized water in central heating systems, water cooling systems in engines, recycling water systems, and house water systems. � It can prevent damage to the endothelium (the layer of scale like cells that line the inside of the blood and lymph vessels, also found in the lining of the heart and some other body cavities). This has the effect of inhibiting the build up of cholesterol, thereby greatly reducing the chances of cerebral and cardiac arteriosclerosis (thickening and hardening of the arteries). � The viscosity of the water is lowered, resulting in improved blood flow thereby aiding in the prevention of cerebral and cardiac thrombosis (clotting of the blood in the circulatory system resulting in the obstruction or complete blockage of the blood flow). � Magnetised water greatly improves the solubility of calcium thereby inhibiting crystallization and, in fact, dissolving already formed calculus (any hard, solid, concretion or deposit in any part of the body, such as kidney stones, or in the arteries) allowing it to become smaller, looser, and easily broken. It is therefore helpful in the treatment and prevention of kidney and cholecystitis (gallstones). � It has been found to seemingly increase the weight of the spleen (which has various functions in modifying the structure of the blood) and thymus, heightening the body's production of disease resistant antibodies, whilst also aiding anti-aging. � It has been found to seemingly increase the content of the body's immunoglobulin and enhance the phagocytosis (the action or process of leucocytes [white blood cells] attacking bacteria) of the liver, spleen and blood vessels endothelium. This is of considerable benefit to the cellular immune system. � It can lower the content of blood plasma urea and free amino acid, aiding in the prevention of renal failure. � Magnetized water has been shown to assist in the protection of the stomach mucous, promote small intestine movement, and increase the active dissolution of food, there by alleviating the level of the pathological process of stress induced ulcers. � The treating scope of magnetized water is such that it can prevent, alleviate or cure arteriosclerosis, hypertension (abnormally high blood pressure, especially in the arteries, or a diseased condition of which this is the chief symptom), coronary heart diseases are also able to be treated. 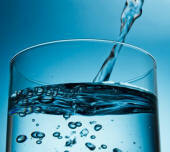 � Gargling with magnetized water may fight gum disease. Experimental study and clinical observation have demonstrated that there are no side effects from drinking magnetized water over a long period of time. This is not �witch doctory� or �hokum�. Water as medium is a scientifically proven and remarkably effective way of radically increasing the power of magnets. In short, when you drink water that has been magnetized, the magnetism travels into the stomach and is absorbed into the blood steam through the bowel wall, it is then very rapidly distributed around the whole body. Of course the magnetic field that is circulating around the body has the same effect on the inside as the magnetic field has on the outside of the body. It will reduce inflammation within the body plus increase blood flow and oxygenation of the tissues, especially around any damaged areas. Think about it... when you drink magnetized water you are tackling your problem from inside and outside at the same time. This 2 sided approach will most definitely increase the strength of the magnetic field at the point of pain, plus it will also speed up the healing process by increasing the absorption rate of external magnetic fields by an amazing 10 times! Your body stores harmful toxins within the tissues (dermis) of the skin, to keep the toxins from poisoning the body they are stored in small pockets of fluid, this is seen as cellulite and feels like lots of little raised bumps ( the body can store an extra 2 litres(4� pints) of fluid containing toxins in the tissues). Toxins are released during many processes in the body such as: during the inflammation process; from the breakdown of medications (particularly painkillers and high blood pressure tablets); and from the chemicals and additives in food and from environmental pollution. Toxins are normally detoxified by the liver and sent to the kidneys for excretion (expulsion of waste products). Some toxins are potentially harmful to your body and can not be safely detoxified by the liver. As magnetized water increases the size of the water molecule, it's ability to absorb toxins is much greater! So, as the magnetism of water is absorbed into the blood stream and transported around the body, harmful toxins are drawn out of the tissues and safely transported to the liver and then onto the kidneys for excretion from the body. In a nutshell, you can lose as much as 2 liters (4� pints) of excess fluid that you don�t need! The effect of losing this excess waste fluid is that you will have so much more energy, and sleeping will be easier and generally you will have a great sense of well-being. The Effects of Magnetic Fields on the Taste of Water. Depending on the where you live magnetizing water may have no effect at all on the taste of your water, or it may dramatically improve the taste of the water. This is due to the vast differences in the calcium and magnesium (the minerals that make up lime scale) content of the water. Most people will be familiar with the terms hard and soft water. Hard water refers to water containing a high concentration of calcium and magnesium. Soft water refers to water with low concentration levels. Rain water is naturally soft - it does not contain any minerals, but as it seeps through the ground it can pick up minerals, such as calcium and magnesium compounds, from the soil and rocks it passes through. If rain water passes through soft rocks like chalk or limestone, it picks up these minerals. If it passes through hard rocks, such as granite or through peaty soils, it does not pick up these minerals and so remains soft. Hard water causes pipes to fur up and scale to collect in kettles and in electric irons and washing machines. If the scale collects on heating elements it shortens their life and makes appliances less efficient. It is also more difficult to work up a lather from soap, washing up liquid and washing powders. It can also cause "tide marks" on basins, sinks, baths and toilets. If you live in a hard water area you will notice quite a considerable difference in the taste of your water once it has been magnetized. The magnetic field reduces the calcium and magnesium content in the water, which softens the water and improves the taste. If you already drink soft water, you will probably notice very little difference, or no difference at all to the taste of your water once it has been magnetized. Magnetized water may sound like a panacea for all illnesses and ailments, but unfortunately it isn�t that simple. Magnetized water has numerous benefits for the body and it will boost the strength of externally used magnets by 10 times, but when used alone it will not take all the symptoms of an ailment away with out any other magnetic devices. Having said this, magnetic water is an extremely powerful natural liquid that has immense potential for assisting in the treatment of a huge variety of conditions. As research into magnetic water continues, we can only conclude that an even greater list of properties and benefits will continue to be discovered. It is perfectly safe to drink as much magnetized water as you like, there is no limit and you can never overdose on it. In some chronic and severe conditions, the more you drink the greater the benefit. Ok, now you know! The benefits provided by nature's own tool are many. This is why so many companies are starting to offer magnet related products for the home, the body, and more. Below we've presented a few products that we use in our daily lives. We believe every home can benefit from magnetic field therapies. Everyday, people throughout the world are successfully using magnetic therapy to eliminate chronic back pain, headaches, toothaches, arthritis, tendonitis, nerve pain, carpal tunnel syndrome and a host of other painful and/or chronic maladies.